Man and Big Van, originally uploaded by Alan Perryman. I hope that isn’t the ‘big van’ in question! 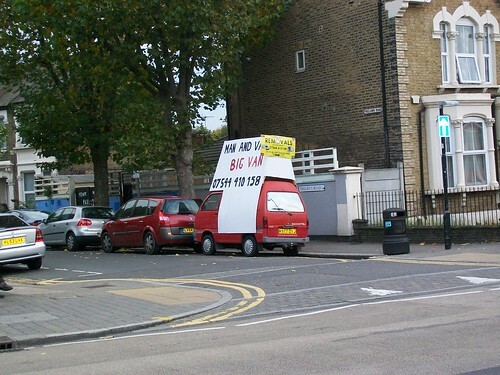 Spotted just up from Leyton tube on the way to the Piglet Beer festival at the Orient. Ghosts on the floor, originally uploaded by Alan Perryman. 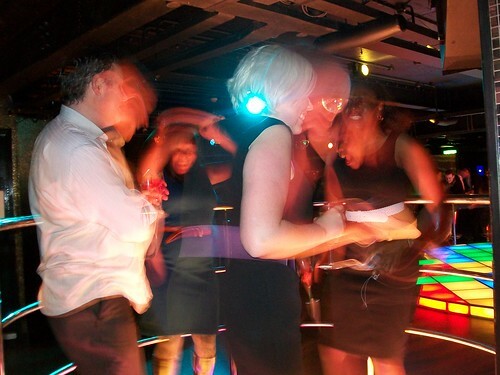 Just got back in from a leaving do and a ‘sten’ do. You could argue that as I am capable of uploading photos to the internet, I can’t have had that much of a good time but I assure you I did! This shot, taken on a regular ‘compact’ camera just had to be seen on a larger screen. At the moment I’d probably struggle to capture this kind of thing on my SLR, so I am rather pleased with the compact’s efforts! Anyway, time for a glass of water then bed! I know what makes a journey more fun. Chicanes. 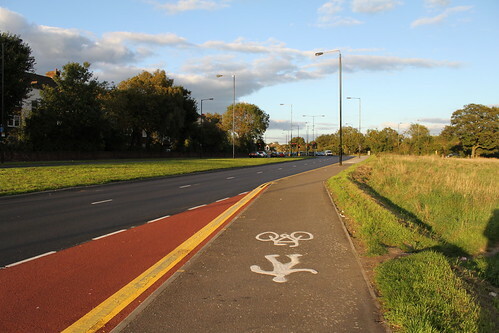 Oh yes, somebody actually designed it to be like this – why not just have the green cycle lane down the left and have pedestrians on the right? I mean, it’s not like there’s a shortage of space. This is the retail park on the bottom of the North Greenwich peninsula, formerly known as Blackwall Reach. Is a Walthamsow a flying pig? 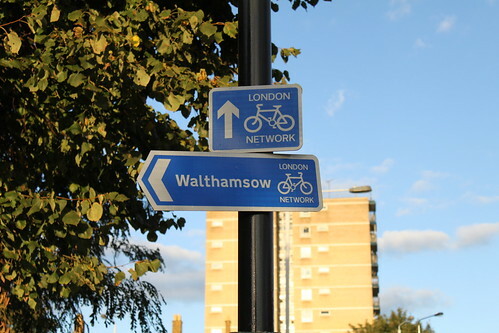 Just down the road from the glorious road improvements on Wood St Walthamstow, is this fine sign. Attention to detail? Thought not. 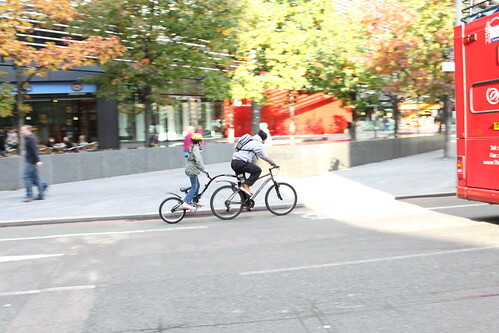 Further up the cycle lane disappears completely – as suddenly one is encouraged to cycle up the pavement. 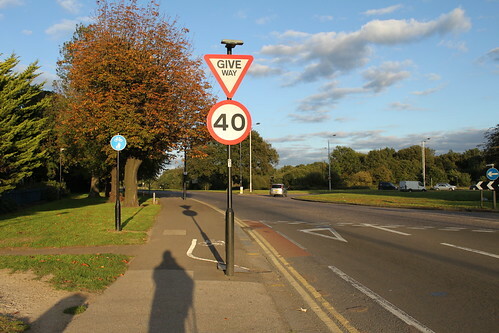 Personally I prefer not to – as a pedestrian I don’t particularly like the idea of sharing my space with cyclist who is probably travelling at twice my speed! And why bother painting the red bit of the lane if cyclists are meant to swerve off behind the sign onto the pavement? Over to the other side of the road and there’s some white paint to let you know to expect cyclists. Boris Bikes and Boris Hall, originally uploaded by Alan Perryman. 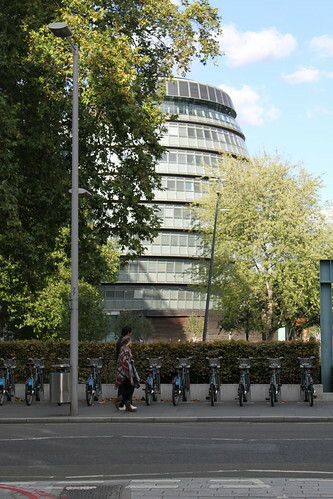 Just a quick picture post today – Boris bikes lined up on the street behind the Mayor’s office, City Hall. 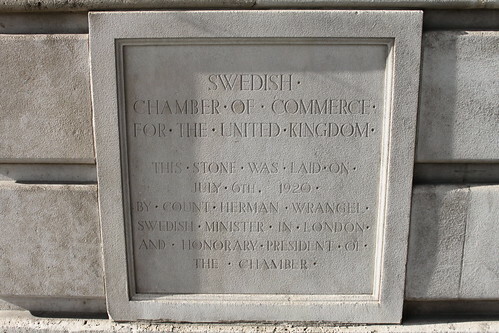 Swedish Chamber of Commerce, originally uploaded by Alan Perryman. I don’t know why either. Speeding cyclists, originally uploaded by Alan Perryman. I’ve wanted to try taking panning shots for a while – the idea of inverting the speed and freezing the moving object really appeals for some reason. I reckon this photo might be better cropped – the tour bus and pedestrian are slightly ugly intrusions into the image. For the camera geeks, this was taken in Av mode – with the aparture opened as wide as it will go on my kit lens, the standard 18-55mm canon. 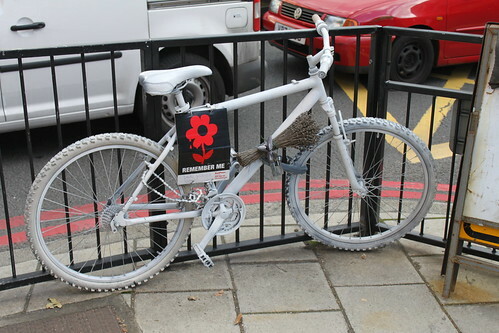 Ghost Bike, originally uploaded by Alan Perryman. Spotted at the corner of Tower Bridge Road/Druid St. Not much else to say other than: RIP David Vilaseca. 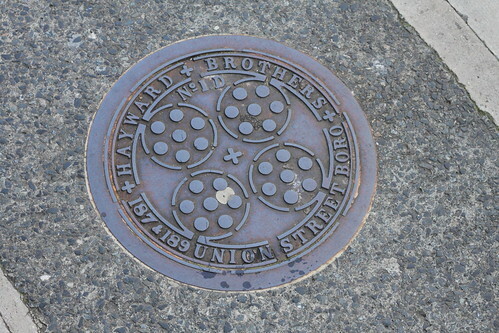 Hayward Brothers, originally uploaded by Alan Perryman. I like Victorians. Would any other society really have a propensity to try make the most banal items of street furniture vaguely attractive. Seen on the floor just off Paddington St, Marylebone.